Just click on the menu and select the tablet in the sidebar. This way you will have a hamburger menu both on mobile and tablet. Hello Eldar, thank you for that, I guess I was slightly confused about the three icons, which seem to be all selected by default - I claim reasons of old age! Thank you for the kind words. I am really glad you’ve found my videos helpful! sorry for hijacking this topic (please inform me, if i need to open a new topic). the solution does work when the tablet (in my case an iPad) is in horizontal position. am i missing something? obviously. please point me to the right solution, so the hamburger menu, is available in horizontal position. Blocs thinks the iPad in the horizontal position is a desktop. Some Ipads actually run at a higher resolution than some desktop/laptops. If you want this to happen you have to set the menu to toggle at the large breakpoint for the hamburger menu. 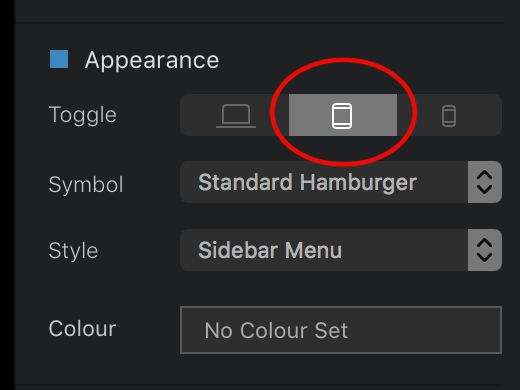 The only native option is to have all breakpoints show the hamburger menu.